In a few days, we will celebrate Thanksgiving. Perhaps we will share a meal with family and friends. What are you thankful for? I see so many parallels in my past life and now. Except now, I am grateful for all of it. The hard, hurtful times along with the fun and happy. I believe it’s more than equal parts – it’s how Jesus wants to live in me. “Grateful for all the pieces.” In this way, everything is able to be a witness to another. Psalm 100:4 Go through his open gates with great thanksgiving; enter his courts with praise. Give thanks to him and bless his name. Leviticus 7:13 This thanksgiving peace offering shall be accompanied with loaves of leavened bread. Deuteronomy 16:15 This feast will be held at the sanctuary, which will be located at the place the Lord will designate. 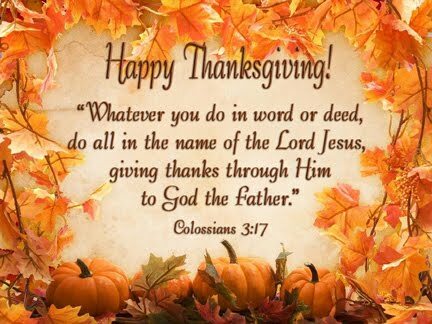 It is a time of deep thanksgiving to the Lord for blessing you with a good harvest and in so many other ways; it shall be a time of great joy.